Common variable immunodeficiency disorder (CVID), the commonest symptomatic primary antibody deficiency syndrome, is characterised by recurrent bacterial infections, particularly of the upper and lower airways; it is also associated with an increased incidence of autoimmune and neoplastic disorders. CVID has a high prevalence of infectious, inflammatory and neoplastic gastrointestinal diseases. Up to 60% of the patients with non-treated CVID develop diarrhea and 10% associated idiopathic malabsorption with weight loss. The case of a 50-year-old woman with CVID-associated diarrhea, abdominal pain and bloating of one year's duration is reported. An exhaustive evaluation made for secondary causes of her symptoms was unrevealing; she was treated with loperamide and diet, without improvement. She later followed a course of oral budesonide for 3 months; her clinical symptoms disappeared and her quality of life improved. In conclusion, we report the case of a patient with CVID-related chronic diarrhea who responded well to oral budesonide treatment. This outcome provides the gastroenterologist with a new therapeutic option in this difficult group of patients. Key words: Common variable immunodeficiency. Diarrhea. La inmunodeficiencia común variable (IDCV) es la deficiencia primaria de anticuerpos sintomática más frecuente y está caracterizada por infecciones bacterianas recurrentes, especialmente de las vías aéreas superiores e inferiores, y también asociada a incremento de enfermedades autoinmunes y neoplasias. Presenta alta prevalencia de enfermedades gastrointestinales infecciosas, inflamatorias y neoplásicas. Hasta el 60% de los pacientes con IDCV no tratados desarrollan diarrea y el 10% desarrollan malabsorción idiopática asociado a pérdida de peso. Presentamos el caso de una mujer de 50 años con IDCV que presenta diarrea crónica, con dolor y distensión abdominal desde hace 1 año. Realizándose múltiples exploraciones y descartando causas secundarias de diarrea crónica, se inicia tratamiento con dieta y loperamida sin mejoría. Posteriormente se realiza tratamiento con budesonida vía oral durante 3 meses con desaparición de la clínica y mejoría de la calidad de vida de la paciente. En conclusión presentamos el caso de una paciente con IDCV y diarrea crónica que presenta muy buena respuesta al tratamiento con budesonida vía oral. Esta observación provee al digestólogo de una nueva opción terapéutica para este difícil grupo de pacientes. Palabras clave: Inmunodeficiencia común variable. Diarrea. Common variable immunodeficiency (CVID), also known as acquired hypogammaglobulinemia, is the most frequent primary antibody deficiency (1,2). CVID is characterized by recurrent bacterial infection, particularly of the upper and lower airways, and is also associated with an increased incidence of autoimmune diseases and neoplasias (3). Incidence is between 1:25,000 and 1:200,000 inhabitants, with a greater prevalence in Northern Europe (4). CVID affects men and women equally, and typically presents after puberty and before the age of 30, with some evidence of a bimodal distribution peaking between 1-5 and 18-25 years (5). Many inheritance patterns have been observed; however, sporadic cases are most common. Although CVID was first described in 1950, and despite advances in molecular biology, its pathophysiology remains poorly understood. The disease probably results from a non-defined immune dysregulation leading to a failure in B-cell differentiation with immunoglobulin secretion deficiency (6). The prevalence of infections, inflammatory and neoplastic gastrointestinal diseases in CVID patients is high (9). These include lymphoid nodular hyperplasia, intestinal inflammatory disease (ulcerative colitis or Crohn's disease), celiac-like disease, pernicious anemia, giardiasis, and non-specific malabsorption. Up to 60% of untreated CVID patients develop diarrhea, and 10% idiopathic malabsorption with weight loss (8). Mainstay treatment is replacement therapy with endovenous or subcutaneous human immunoglobulin (3). Unfortunately, immunoglobulin therapy has little impact on diarrhea. The treatment of diarrhea in CVID patients is usually symptomatic. Some studies have shown that corticoid therapy improves diarrhea in these patients. However, considerable side effects during long-term treatment limit its use (9). Oral treatment with enteric-coated budesonide has proved to be effective in Crohn's disease with ileal and ascending colon involvement, probably due to its potent local action. Budesonide has 9-12% bioavailability in healthy subjects since its first-pass metabolism approaches 90%, thereby limiting its systemic effects (10,11). Some studies have demonstrated the safety of budesonide in the long-term treatment of patients with Crohn's disease, and one study reported a case of budesonide use in a patient with CVID and diarrhea. Below, we report the case of a patient with underlying CVID who presented with diarrhea, abdominal distension, and poor quality of life. A 50-year-old woman was referred to our center because of chronic diarrhea. From the age of 3 years she had suffered repeated episodes of cough with purulent expectoration, fever, and pleural pain, and underwent atypical segmentectomy of the left lower lobe due to bronchiectasis at the age of 15. She had also had infection from a facial lesion at the age of 4 with a cutaneous-parotid fistula, and had undergone appendectomy with a surgical wound infection at the age of 19. Giardia lamblia infestation was reported at the ages of 7 and 10 years. She had had repeat episodes of sinusitis and suppurative otitis. Common variable immunodeficiency was diagnosed at the age of 20, and since then she had been receiving endovenous immunoglobulin treatment every 3 weeks. The present disease began one year ago, with an increase in her usual diarrhea, up to 20 liquid stools a day with no pathological products, associated with abdominal pain and meteorism. In addition, she had a weight loss of 6 kg in the last year. Physical examination revealed the patient to be conscious and well oriented, well hydrated, with an acceptable general status and normal color. Rhythmic cardiac tones were normal with no signs or symptoms of heart failure. Respiratory auscultation revealed a decrease in vesicular murmur in the left hemithorax. Neurological examination was normal. The abdomen was soft, depressible and non-tender, with presence of peristaltism and absence of visceromegalies. A general lab work-up revealed no significant alterations (Table I) total proteins 6.8 g/dl, albumin 4.2 g/dl, erythrocyte sedimentation rate 10 mm/1 hr, C-Reactive protein 0.9 mg/dl, and alpha-1 antitrypsin 128 mg/dl (normal 103-200). Anemia was normal, antigliadin antibodies IgG and IgA were negative, protein electrophoresis was normal, lymphocytic immunophenotype was CD4 559, CD8 468, ICD4/CD8 1.2, IgG 809 mg/dl (in replacement therapy), IgA < 10 mg/dl, IgM < 10 mg/dl, complement study was normal, and coproculture was negative for bacteria and parasites. An esophago-gastro-duodenoscopy was performed on an outpatient basis that reached the second duodenal portion and was normal, with a normal biopsy. A culture of the duodenal aspirate was negative for G. lamblia. Total colonoscopy and ileoscopy were also normal, with a normal biopsy. A small-bowel follow-through with barium sulphate was normal, and an abdomino-pelvic CT scan showed no pathological alterations. As the diagnostic test proved normal, symptomatic treatment with diet and loperamide (up to 20 tablets/day) was started, with no improvement in clinical manifestations. Thus, it was decided to initiate treatment with budesonide 3 mg three times daily for 3 months, which led to progressive clinical improvement. The patient currently presents 1-2 stools/day (type 3-4 on the Bristol scale); pain and abdominal distension have disappeared, and her quality of life has significantly improved. Up to 60% of CVID patients present with diarrhea and 10% develop idiopathic malabsorption associated with weight loss (8). Diarrhea may be caused by different infectious organisms, the most frequent of which are G. lamblia, Salmonella, Shigella and Campylobacter, which may be difficult to detect in coproculture and under the microscope. Inflammatory disease is also common, and mainly involves the colon (12). Differentiating between diarrhea of infectious or inflammatory origin is difficult (9). Some patients have small-intestine involvement with villous atrophy mimicking celiac disease, with poor response to gluten-free diet (13). A thorough study of secondary causes of diarrhea was negative in all aspects. Diet and pharmacological treatments were unsuccessful. Despite correct IgG levels with endovenous replacement therapy every 3 weeks, the patient continued with diarrhea, thus confirming the hypothesis that gastrointestinal manifestations in CVID patients may usually results from defective T-cell function rather than antibody deficiency (14). Very little is known on the pathophysiology of diarrhea in CVID. It is believed that it may be related to increased apoptosis, decreased plasma cells, and increased tumor necrosis factor alpha (TNFα), shown in the histology of some patients to produce T lymphocyte dysfunction (14,15). Given the poor understanding of its pathophysiology, few therapeutic options are available for diarrhea in CVID patients. Most important is to definitively rule out secondary causes, either infectious or inflammatory, from the start. Corticoids inhibit immune inflammatory response, partly via their effect on T cells; however, little experience exists on their use owing to systemic side effects (9). In 2007, Chey W et al. published the first case of a 47-year-old woman with diarrhea and CVID who showed a good response to oral budesonide treatment. 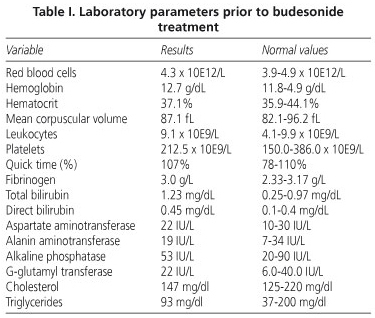 The patient's number of stools decreased and immunoglobulin levels improved; those authors therefore concluded that budesonide could exert a local intestinal, but also systemic, effect (16). In conclusion, we present the first case in Spain of a female patient with chronic diarrhea and CVID successfully treated with oral budesonide and with no side effects. Thus, and given the understanding of this drug and its long-term use in Crohn's disease, we may suggest its use for the treatment of diarrhea in patients with CVID once other causes have been ruled out.